What do you think of when you think of mead? You might imagine Vikings with braided beards quaffing something potent out of cow’s horns. Or possibly, jolly Hobbits clinking pewter cups of golden liquid between nibbles of seed-cake and tarts. But mead is no longer the drink of the mythical past. As the recipe for Ethiopian Tej has been handed down over generations, so has the taste for mead stayed ever-green in the hearts of discriminating hooch lovers. And it’s making a big come-back now. Mead is probably the oldest known dram, although some like to argue that beer came first. As it’s fairly simple to brew at home, people have been brewing some form of it across Asia, Africa, Europe and the Americas since ancient times. Where grapes don’t grow for wine, there’s honey to ferment for mead. Archaeologists have discovered residues of a fermented honey drink in Chinese vessels that date back to 7000 BC. Mead was enjoyed in ancient Greece, while around 60 CE, the Roman agriculturalist Columella left a homely recipe for it. Well, he did say that the water should have been “rainwater stored for several years,” probably to ensure that all sediments had fallen to the bottom of the container. More recently (about 100 years ago), my Ukrainian great-grandmother brewed mead for the family to enjoy during Passover week get-togethers; probably a low-alcohol, kosher-for Passover version to offer instead of beer. Don’t let anyone tell you different: wine or beer flavored with honey isn’t the same drink at all. (On the other hand, mead flavored with wine grapes is still mead, albeit in a specific category, pyment.) Mead’s base is honey and water, and yeast to ferment it. It may or not be flavored with spices, fruit, or vegetables. There are as many varieties of honest mead as there are of grape wine, depending on the skill and taste of the mead-maker. Today, no one’s afraid of infusing any flavoring they like into mead. Imagine: pineapple mead. Chocolate mead. Lapsang Souchong mead (I’m not kidding). Varietal mead that shines with the flavors of its original honey only. You can drink a fun sweet mead infused with chilies at a BBQ or sip a dry mead fermented with cherries at an elegant dinner. Or taste a delicate Swedish mead flavored with elderberries; malted Welsh braggot, or a festive metheglyn spiced with cinnamon and cloves. Red meads, white meads, sweet meads, dry meads. Mead-makers have long adapted good wine-making practice in brewing the honey potion. Strict attention to cleanliness, fermenting with specially developed yeasts, and fermentation vessels with airlocks to let gases escape while preventing dust and small insects from dropping in – these, and other modern techniques reduce the chances of spoilage and help the home mead maker to produce a gallon or ten of delicious brew in her own kitchen. 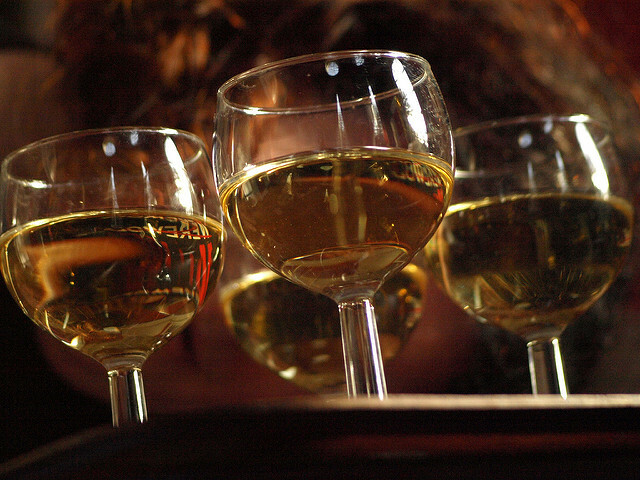 Mead’s alcohol varies from 5%, like beer, or up to 20% (appropriate for sweet dessert meads), again depending on the style desired by the mead maker. The encyclopedic Gotmead site provides all the mead recipes and discussions that a mead maker will ever need. If homebrewing isn’t your thing, Google “meadery” in your locale, and you may be pleasantly surprised to find one near you. While California leads with the largest number of meaderies, commercial mead is sold across the UK, in France, Australia and New Zealand, and even in Costa Rica. New, boutique meaderies pop up all the time. Time to find out what that honey brew is all about, don’t you think? Watch for our upcoming coverage of the Web’s most popular, easy-to-make mead recipe, Joe Mattioli’s Ancient Orange Mead, in his own inimitable voice. Photo of glasses with mead by Sam Easterby-Smith via Flickr.